Crochet checkerboard is actually a type of stitch in the craft. However, it is also a design idea, and it's a playful one that packs a big punch. The classic checkerboard design is graphic and fun. Work it in black and white, vary it with any other two colors, or change it up completely by making it extra colorful. However you adapt it, the checkerboard pattern can give retro-but-chic style to any accessory, garment, or decor item that you want to crochet. Here are ten excellent patterns to get you started. The basic crochet checkerboard pattern is made using single crochet stitches. Two colors are alternated to look exactly like a board from the game of checkers. Instead of red and black or black and white, which are classic checkers colors, this pattern uses two neutrals for the squares. It's a light, fun, twist on the design. A third color is added for the placemat edging. These little crochet coasters are the perfect pattern to practice making a checkerboard design. You can make a checkerboard by creating square motifs that you join together, but many people find it better to change colors throughout the row instead. Learn how with these easy free pattern. The checkerboard pattern is often worked as a flat square or rectangle, such as for coasters or a blanket. However, it can also be worked in the round. In this case, it's used to make a unisex earflap hat. Checkerboard crochet doesn't have to be exact squares. Here we see it as rectangles instead. This free crochet pattern will show you how to carry the yarn and join in two colors to get the checkered effect with neat clean edges. The crochet cowl is a simple rectangle. The matching fingerless gloves are worked in the opposite color combination, which makes a nice effect when the two accessories are worn together. The gloves also show how a checkered section can accent a solid section in the same project. Most crochet checkerboard patterns stick to two colors for the squares. However, you can take the basic idea and change it up by adding a third color. That's what is so great about this free crochet blanket pattern, which is worked in the primary colors. That makes it a great choice as a baby blanket, but the pattern comes in six sizes from stroller blanket to king-sized afghan. The three colors of squares are laid out to create stripes on a diagonal. This crochet apron pattern showcases another way to use three colors to make the checkerboard design. The pattern is made using pink and blue. However, two shades of blue are alternated from row to row. It's a subtle difference, and it's one that is cute and kitschy, which is perfect for a retro-inspired apron design. 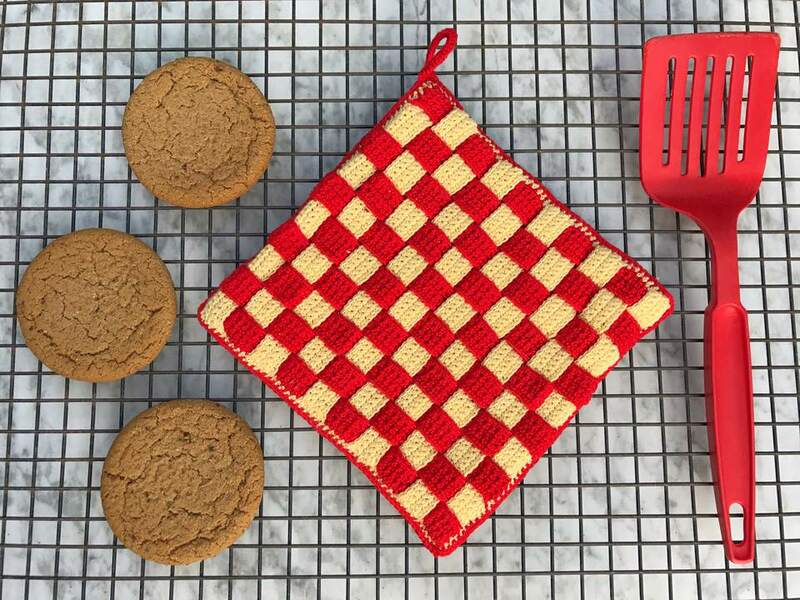 That retro kitsch style makes checkerboard a design that is perfect for kitchen crochet. That's what makes these crochet potholders such a great idea. Each design is worked in two colors. This also shows how you can add appliques on top of squares in one color for an extra element that still sticks with the theme. In contrast to adding more colors, you can actually achieve a checkerboard effect in a single color. It's done by using two very different stitch textures for the alternating squares. This is just a single crochet stitch, but in half of the squares it is solid and in the other half spaces make it more open. The designer of this crochet cowl explains that "just changing color every 3 rows and shifting the pattern to the left by a row will make a checkered pattern." 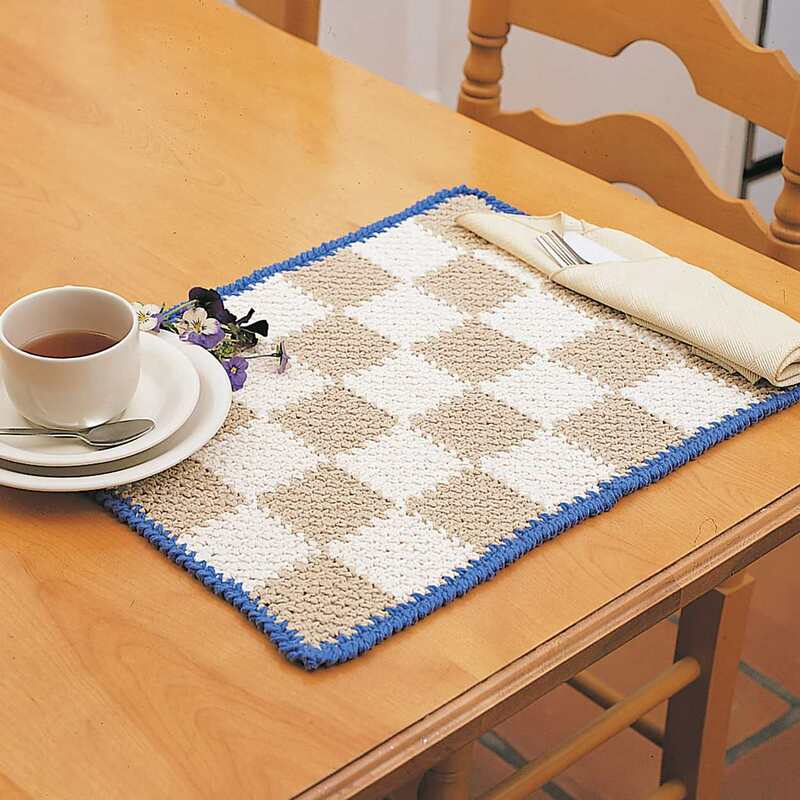 The stitch pattern has elongated stitches that add a little twist to the typical straight-edged checkerboard design. It's a simple color change that you can use to make a bold black-and-white accessory. Once you get the hang of checkerboard crochet, you can use it to make anything at all. Here it's used on an elephant stuffed toy pattern. The graphic pattern is perfect for kids, so it's a natural choice for toys like this one. It's a surprise we don't see it more often.